Get ready for some pomp, circumstance — and politics. The first half of tomorrow’s LA Unified school board meeting, starting at 10 am, will be a swearing in ceremony for four newly elected board members by people or, in some cases, groups of people, of their choice. Scott Schmerelson, Ref Rodriguez, George McKenna and Richard Vladovic — will be taking an oath, each committing the next five years to the district. Voters recently approved a measure to align school board elections with other statewide races in order to boost voter turn out. That means the four board members will sit on the board until 2020. The ceremony and brief reception afterward are taking place at the Edward R. Roybal Learning Center Gymnasium, just a few blocks from LA Unified headquarters. Following the festivities, the full board will convene at 1 pm for the first meeting of the new fiscal year to elect a new president, a process that in recent years has not provoked much public debate but this year may prove to be different. A lot different. Board members Mónica García and Mónica Ratliff expressed an interest last week in waiving a term limits rule to enable Vladovic, president since 2013, to lead the board a third consecutive year. The current board rule allows a president to serve only two consecutive years. While neither Monica has moved to add it to tomorrow’s agenda, Jefferson Crain, board secretariat, says it can be brought up as part of the election. “A waiver does not have to be separately on the agenda since it is germane to the election,” he told LA School Report. Like other board issues, a resolution to waive the rules and elect a president requires four votes. It’s conceivable that the board would split 3-3 on suspending the rule, leaving Vladovic’s vote as the deciding factor in whether he would serve another term. While he voted for the rule when it was first passed in 2013 and he abstained last week on a motion by Ratliff to waive the rule, he could still vote to suspend the rule, essentially putting himself back in office. If an effort to suspend the rule fails, any of the other six could be elected although Steve Zimmer, the current vice president, would appear the front runner. Neither Ratliff nor García returned messages seeking comment. 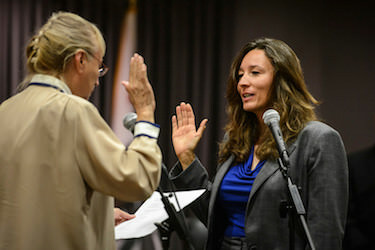 Another order of business for the new board is the appointment of board vice present, as well as members to serve in a variety of roles, including positions on the Los Angeles County School Trustees Association, California School Boards Association and the Council of Great City Schools.